Joshua Morgan and Derek Kahn Thompson in Theater J's production of "The Chosen." Photo credit: Stan Barouh. There’s something old-fashioned about Theater J’s production of The Chosen, presented with a quiet sensitivity in the staging and the acting, echoed in the warm wood of James Kronzer’s set. To call it old-fashioned is to by no means denigrate its power. It has a sepia-toned subtlety. 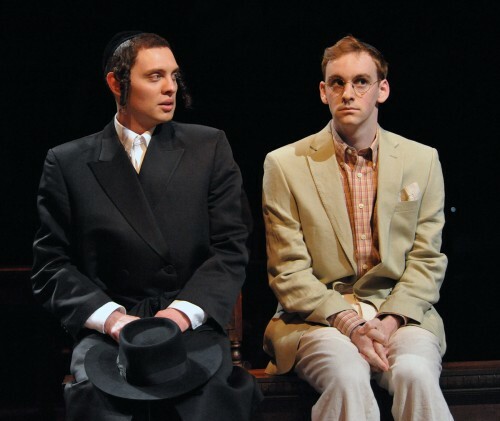 Theater J first produced an adaptation of Chaim Potok’s novel ten years ago, and is returning to it now under the aegis of Arena Stage. Setting a play of such intimacy in the airy round of the Fichandler is a bit of a risk – a play about the complicated relationships between fathers and sons requires a closer access than that large theater can provide, and sometimes I longed for the smaller confines of Theater J’s usual home. But it’s thrilling to see a company I’ve long admired in the gorgeous space by the waterfront, and it expands the audience capacity to see two Washington powerhouses – Edward Gero and Rick Foucheux – command the stage regardless of its size. “Acquire a teacher, chose a friend.” This is the advice David Malter (Edward Gero) gives his son Reuven (Derek Kahn Thompson) as essential to start becoming a man. He’s just met his unlikely friend Danny (Joshua Morgan), after a baseball game that turned into a battle between Hasidic Jews and those Jews they consider “apikorsim” – heretics. Unbeknownst to Reuven, Danny has just met his unlikely teacher, Malter himself, whose reading suggestions include Freud and Darwin. Not exactly what his father Reb Saunders (Rick Foucheux) would want his son to be reading in preparation to become a “tzaddik” – the spiritual leader of his community. The adaptation written and directed by Aaron Posner takes its time exploring the nuances between the four men, building to a shattering moment between a father and the son he raised in silence. Derek Kahn Thompson, Aaron Davidman, Joshua Morgan, and Rick Foucheux in The Chosen. Photo credit: Stan Barouh. Guided along the journey as a series of flashbacks by the Older Reuven (Aaron Davidman), we see the boys mature as they become friends, then foes for a while, and friends again. The growth of their relationship is mirrored in the interplay with their fathers, two different men who never meet on stage but whose strong mutual respect for each other provides the backbone for the boys’ development. “Your father is a great scholar, but” (shaking his head) “he writes,” says the majestic Reb Saunders. Rick Foucheux completely transforms himself in this role. I actually had to double-check my program to make sure it was him. It’s a powerful performance as the leader of a Hasidic sect who has raised his blindingly intelligent son Danny in total silence, only speaking to him when they fervently study and debate the Talmud. Reuven joins those sessions and becomes the conduit for the father to speak to the son, a role he is increasingly uncomfortable with until his wise father points out its necessity. The intellectual and religious battleground of study is the only way the father can show his deep affection for his son, and as the divide between them grows, Reuven becomes more integral to keeping them together. The play’s action does sometimes gets a little dusty. To be fair, the conceit of having Older Reuven on hand to explain the intricacies of Hasidic life and the rise of Zionism will be very helpful to audience members not familiar with the topics, and it’s a good introduction to those themes. Aaron Davidman is the perfect narrator, guiding you with clarity and focus. There are simply beautiful moments of ensemble acting to mine here – the quartet are entirely believable as fathers and sons. Gero and Foucheux are inspiring in their dedication to embodying the roles of two men who are not so very different after all, and the two younger actors are obviously inspired to meet the challenge of acting with them. 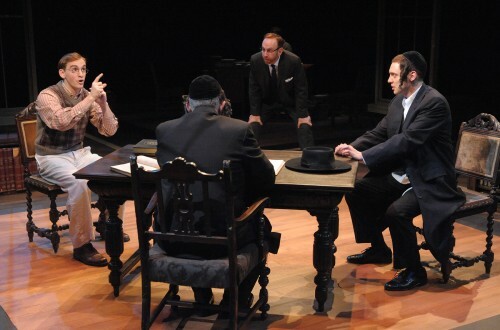 Though The Chosen is definitely a play about Jewish life at a certain time and place – and indeed, this production evokes Williamsburg, Brooklyn in the 1940′s very succinctly – its chief treasure is the exploration of the relationships between fathers and sons, and what it means to become truly one’s own man. That simplicity and old-fashioned sensibility makes for a refreshingly meditative night at the theater. Theater J’s production of The Chosen now thru March 27 at Arena Stage, located at 1101 Sixth Street SW, Washington, DC 20024. Closest Metro: Waterfront (Green line). For more information call (800) 494-TIXS (8497).